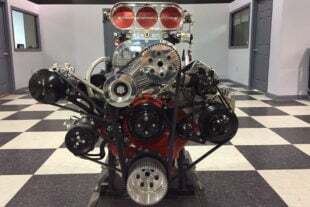 Late Model Engines builds an 820 horsepower 440-inch LT1 - N/A! The new GM LT1 platform had a tall order to fill when it was developed to replace the incredibly successful LS-series engine. It had to be engineered to outperform the LS in every way, including its use as a swap candidate into older vehicles and in its peak power capacity as the most potent engine ever bolted into a new Chevrolet. The LT engine boasts several significant upgrades from the LS to make and support more power than the LS. Among the most noteworthy of these upgrades is the direct injection system which sprays fuel directly into the combustion chamber. This means the fuel doesn’t have to find its way around the intake valve and it can be sprayed into the best-possible pattern for a very efficient burn. Direct injection is great for making power and also helps fuel economy, since every bit of fuel is burned completely. The best-performing factory crate LT engine at the moment is the LT4, which relies on 9-pounds of boost from an Eaton TVS supercharger to make 640 horsepower at 6,400 rpm and 630 lb-ft of torque. This is a 376 cubic-inch engine with 10:1 compression and a 6,600 rpm redline. 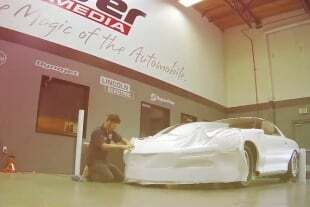 When Late Model Engines (LME) in Houston, Texas got the call to produce a naturally aspirated 440 cubic-inch LT to power the new Camaro campaigned by Brandon and Tiana Weber of Accelerated Racing Solutions of Rancho Cucamonga, California. They wanted to push the limits a bit while cranking out crazy power. Without a supercharger, turbocharger, or nitrous oxide to rely on, everything inside the engine had to be turned up a notch to produce the power needed. 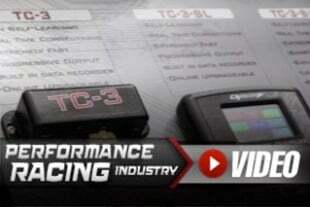 The key to making horsepower without a power adder relies mainly on compression ratio, and RPM. By maximizing both, the engine’s true potential would come to the forefront to support both high compression and high RPM. Just about everything in the engine had to be upgraded. After a plan was laid out, the design of the individual components needed to make the math work, began. Compression was set at a hefty 14:1 to make the power the team needed. This necessitates the use of either VP C-16 racing fuel or E85. The team needed a redline of 8,500 rpm, which would allow the engine to move enough air without overtaxing the valvetrain. The most impressive part of this engine is what was not changed. 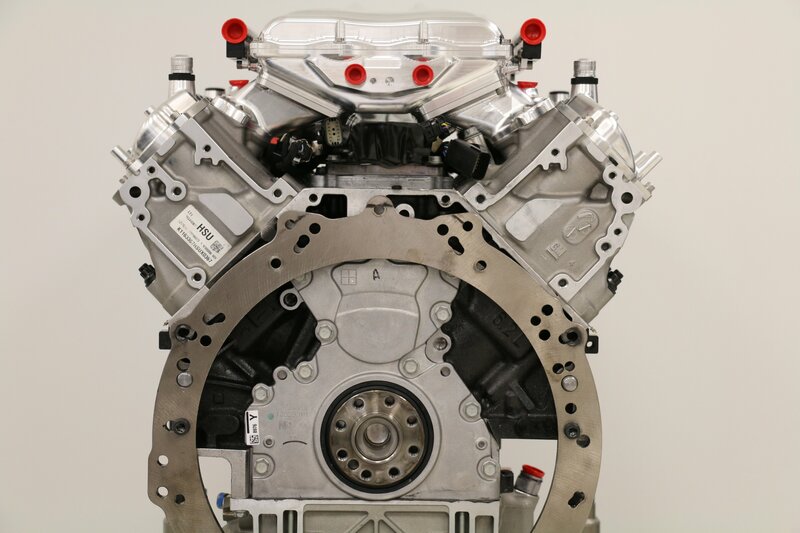 Typically, the most expensive parts of a racing engine build are the block and the heads. These foundational components need to be of premium quality to survive the harsh environment racing brings with it. Luckily, the aftermarket typically delivers premium parts in factory-type configurations. Aftermarket blocks with strategically thicker webbing around the main bearings and cam tunnel are always popular with racers. Sometimes, additional bolts are added to the main bearing caps to keep them aligned and in place under extreme pressure and RPM. The deck area, the surface that the cylinder heads are bolted to, is always thickened up too since keeping the heads secure, sealed, and flat, is a primary consideration in any race application. Occasionally, additional cylinder-head bolts are added to improve stability and sealing around the chambers. Some aftermarket blocks are also plumbed for improved oiling, even including the capability to spray oil up and cool the bottom surface of the piston in some applications. Aftermarket racing heads are also engineered with thicker deck surfaces to support significant power without failing, but the power is made in the ports and chambers. Aftermarket heads generally have larger ports, larger valves, beefier rocker mounts, and more efficient combustion chambers. There is typically excess material cast in place around the ports to allow for increased porting without breaking into the water jackets. 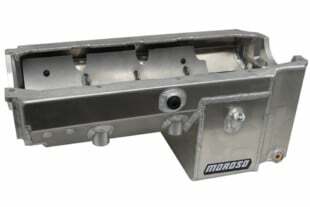 The factory LT block features six-bolt nodular-iron main-bearing caps, an improved cooling design (over the LS), and oil-spray piston cooling right out of the box. This engine is so well engineered that the crew at LME knew that they could go to 14:1 compression and spin to 8,500 rpm without fear. The only question they had was what power level they could obtain with that RPM. To answer this question, LME started with an LT4 block with a 4.065-inch bore. They decided to upgrade to dry Darton Sleeves in each bore to achieve a 4.185-inch dimension for a total of 440 cubic inches. All of the bottom end block hardware was upgraded to an ARP Pro Series 12-point main stud kit. The block was line-bored, stress-relieved and decked before being completely deburred and readied for assembly. The crankshaft used was a 4.0-inch stroke Callies product made from 4340 that accepts the factory 58X reluctor wheel. 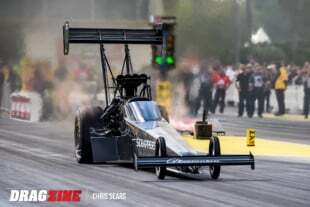 The crank was teamed up with a set of Callies’ Ultra Magnum 6.125-inch connecting rods, which boast ARP 7/16-inch bolts. Callies claims these rods are good to 1,400 horsepower. The pistons needed to be incredibly strong to support 14:1 compression without flexing, but also be light enough to make 8,500 rpm a possibility. They had to be durable enough to last long-term because no race team wants to tear down their engine between races all season. Diamond Pistons answered the call with a set of their finest forgings featuring all the upgrades, like lateral gas ports, double pin oilers, custom valve pocket depths, internal milling to remove all possible weight, and optimized ring lands in the top two grooves. The grooves were filled with Total Seal AP piston rings, stainless chrome top ring, Napier second ring, and 3 mm HT oil rings. Trend Performance supplied their H-13 tool steel wrist pins, measuring .913-inch diameter with .200-inch wall thickness. The rods and the crankshaft both rely on Clevite H-series bearings, which LME modified to use in this application. As mentioned before, the engine breathes through the factory LT4 heads (P/N 12678972), whose ports and chambers were worked over on LME ‘s CNC machines and then hand-finished to perform at a much higher level. The valves are a combination of 2.20-inch intake and 1.60-inch exhaust units made of titanium. T&D Machine supplied a set of its rockers with an adjustable-roller tip for the LT engine. LME chose a set of PSI valve springs with titanium retainers, machined locks, and locators. The heads seal to the block with the help of Cometic Gasket LT1 MLX gaskets that measure 4.180-inch in bore size and .051-inch thickness. For the camshaft, LME worked with Cam Motion to create a custom grind. It features an 8620 billet core and is one of Cam Motion’s custom low-lash solid-roller designs, with .750-inch total lift, and 250 degrees of duration at .050-inch lift. The Morel lifters are solid-roller units with tie bars, and the Manley Performance pushrods are one-piece 3/8-inch diameter with thick .120-inch walls. The timing cover assembly is one of LME’s VVT-delete setups, which is non-phased and uses a single-bolt cam gear. This engine won’t use the variable valve timing anyway since the large cam moves the valves so close to the pistons. The LME cover also uses an innovative O-ring seal design, which eliminates the need for silicone between the bottom of the cover and the oil pan, which makes cam swaps a lot easier. Connecting the crank to the cam drive is a Katech C5R single-roller timing chain. The engine breathes through one of LME’s own beautiful billet milled intake manifolds, armed with billet fuel rails to supply additional fuel. It’s also fitted with a Nick Williams billet LT1 103mm throttle body up front to meter the air coming in with absolute precision. The 103mm throttle body hooks right up to the factory fly-by-wire accelerator pedal setup. The engine was finished off with a set of LME’s valve covers and the factory oil pan. The harmonic balancer is an ATI Performance Products designed for the LT platform and secured in place with one of LME’s balancer bolts. 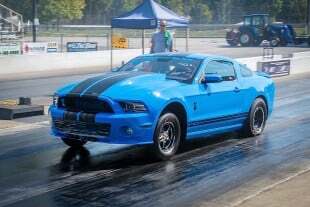 Once assembled, the engine delivered massive power on the dyno, peaking at 822 horsepower at 8,000 rpm and was still pulling. It might have made a few more horsepower up to the redline at 8,500, but everyone is staying quiet about that. Torque numbers are also impressively stout, cranking a peak of 635 ft-lbs at 6,000 rpm. The engine was then packed up and shipped to California, for installation in the Camaro. 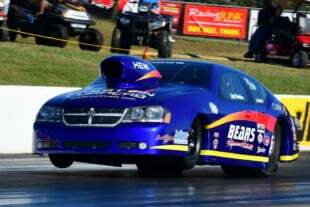 The engine’s owners, Brandon and Tiana Weber are no strangers to high performance. As owners of their shop, Accelerated Racing Solutions, they’ve been making late-model muscle faster as a couple since 2016. They met in high school, where Tiana was racing with her Dad and Brandon was an aspiring gearhead. Once they got together, the idea of opening the shop became a reality. It’s like a hot rodding dream come true, and their focus on late-model GM-powered machinery is finding its audience in Southern California. Their Snow White 2017 Camaro drag car serves as the shop’s mascot and showcases their fabrication and dyno tuning skills. With this engine installed, the work of dialing in the rest of the vehicle began. Tiana, who also drives the car, told us how it was going. The car runs at full weight and still uses the factory fuel system. Its future includes grudge racing, heads-up/no time events, and it’s reliable and consistent enough to run brackets too. Based on the results we see from this 440-cube powerplant with factory block and heads, we’d have to agree with them. Getting 820 naturally aspirated horses using stock components isn’t easy, but Late Model Engines proved it’s possible to do with premium quality craftsmanship and careful design.